ArcGIS Notebooks are continuing the trend of tight integration of Python with the ArcGIS suite. While currently available through ArcGIS Enterprise portal, the next release of ArcGIS Pro is going to support Python Notebooks directly in the desktop environment. Web apps are becoming lighter, more efficient and more mobile-friendly. Progressive web app standards are making it easier to develop functional, responsive web apps rather than needing to delve into the more complicated world of native apps. ArcGIS Pro is finally going to support publishing to standalone servers in the next release! Esri is framing this as a tool for transitioning to Portal servers, but those of us that still use standalone servers will take it. ArcMap really has become obsolete. While Esri is still pledging to support it for "years to come", all new functionality will only be available in Pro. All in all, the Dev Summit is a great resource for keeping up to date on all the cutting-edge technology that Esri has to offer. It's a great learning experience and I look forward to attending again in the future. 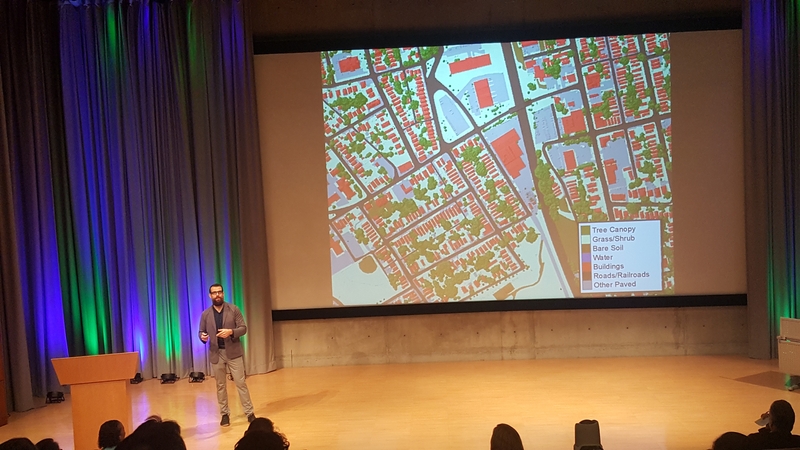 ESRI held its first ‘Imagery Education Summit' in Redlands California this week, and even though I came with high expectations, I was still pleasantly surprised with the caliber of the summit's presentations. It is very difficult to pick out a favorite among these talks; however, I can say that I particularly enjoyed the presentations by Jarlath O'Neil Dunn from the University of Vermont (pictured below), on ‘Success Stories and Progress' in image analysis and mapping, and by Jason Ur from Harvard University, regarding his work with ‘Drones and Archaeology Case Studies' in Iraq. The innovative approaches that they and others at the summit presented were truly inspiring! One take-away from this event is that ESRI is making huge strides to incorporate more remote sensing processing options into ArcGIS Pro's ‘Image Analysis' toolbox. Speaking for myself, as both a remote sensing and GIS practitioner, I am excited about the prospect of being able to do more of my work within just one application environment, as opposed to doing my image stitching in Pix4D, image analysis in ENVI, and then finally my spatial analysis and mapping in ArcGIS. For the sake of efficiency, I look very forward to the day that I can do all of this in just one app. For you drone enthusiasts out there, one neat new feature in the ArcGIS Pro Image Analysis tools is basic image stitching for producing color balanced orthomosaics and digital surface model outputs. This new function is not at the level of what Pix4D or Drone-to-Map can do yet, but for basic RGB image processing it may be good enough for many people's needs. Plus, it is a brand new tool that is bound to improve over time. ESRI now offers a FREE ‘Schools Mapping Software Bundle', which includes both fully functional ArcGIS Pro and ArcGIS Online licenses for every K-12 school worldwide. http://www.esri.com/industries/education/software-bundle#. ESRI also now offers free ‘Massive Open Online Courses' (MOOCs), which among other things include approximately 30 courses on working with imagery alone, http://www.esri.com/mooc/imagery. The future for spatial science has never looked brighter! It's that time again! The worlds largest GIS User Conference has returned for its 38th year and the first two days have been jam packed with content. This is my fourth time attending, and I'm always a bit surprised by how much the conference seems to have grown every time I come down. This year's attendance is around 16,000 people and it shows! The halls of the San Diego convention center are filled with an unbelievable human tide and I've been in a couple of sessions that were standing room only. The first day's plenary session was quite a production as usual, but was lacking in the type of big announcements of new software or major updates that have been the norm in years past. Highlights included a look at how Disney Imagineers developed the city of Zootopia using Esri's CityEngine software and a thought-provoking keynote address from Dr. Geoffrey West about the growth cycles of biological organisms and their links to the development of urban areas. Some highlights from Day 2 included a session on the continued integration of Python and R into the ArcGIS Desktop environment, particularly ArcGIS Pro. The closest thing I've seen to a major announcement so far is that raster support is coming to the R-ArcGIS Bridge with the release of ArcGIS Pro 2.1. I also atteneded a session on Esri's Drone2Map software which looks like a simplified version of Pix4D which has been very nicely integrated with ArcGIS Pro. I think the biggest takeaway from these first days has been that I really need to start seriously working on migrating to ArcGIS Pro! I look forward to what's in store for the rest of the week. Stay tuned for more updates! For many people, the winter holidays are a good time to catch up on things that you've put off the entire year - that article you've been working on since last summer, your merit and promotion package, and taking your GIS skills to the next level! Fortunately, no matter what you want to learn, there are a number of great online resources you can turn to. Knowing what you want to learn is often half the battle. If you're just starting out, perhaps exploring some of the basic concepts and learning how they apply in your field would be a good place to start before jumping into software tutorials. Or maybe you've been stuck for a while on a specific task, like importing data, fixing the labels on your map, or turning your paper map into an interactive web map. If you'd like to chat with a GIS consultant to clarify your goals, feel free to sign-up for the IGIS online office hours, and we'll get you pointed in the right direction. The IGIS team put together some of our favorite "go to" online GIS training resources that we use ourselves all the time. If you don't see what you're looking for below, or have another other site you'd recommend, please leave a comment or drop us an email and we'll add it to the list. Happy Holidays, and Happy Mapping! A little known fact about the University of California's site license with ESRI (including ANR) is that it includes virtually unlimited access to their entire catalog of web courses and online training seminars. Instructor led classes still require a fee, but there are literally hundreds of high-quality recorded e-courses you can take, ranging from introductory to advanced topics, from basic concepts to specific software steps. ESRI web courses are typically 3 hours long, while training seminars are 1 hour, so you can fit them in on a slow day. Check out the course catalog, and remember to filter by "E-Learning" as the format and what you would like to learn in the "GIS Capabilities" box. To take most of ESRI's online training, you need a UC sponsored ArcGIS.com account (note that ESRI.com accounts are different and won't do you any good here). If you don't already have an enterprise ArcGIS.com account and you work for ANR, IGIS can hook you up with one. Just fill in the software request form and check the box for an ArcGIS.com account. You'll also have the option to download the latest desktop GIS software, which might be a good idea if you're still using an older version of ArcGIS Desktop. TIP: If you're brand new to GIS, consider starting with the 3-hour web course called Getting Started with ArcGIS Pro. ArcGIS Pro is relatively new, has a much more intuitive interface, and will eventually replace the venerable ArcGIS Desktop. For additional hands-on experience, ESRI also has a number of self-paced guided exercises you can work through for most of its products. Connected to eXtension.org, a national resource network for US Cooperative Extension professionals, is a GIS training and support group called Map@Syst. They have published a number of recorded webinars on applications of GIS for cooperative extension work, including using maps to engage your audience, story maps, working with Lidar data, Landsat imagery, etc. A great resource definitely worth checking out. If you've got a little experience with web mapping (perhaps from taking an IGIS workshop? ), the exercises in the ESRI Geodev Hacker Labs library are a great way to learn / remember the basic steps. Lots of code examples and explanations take you from A to Z, and everything is on GitHub so they're completely free! ESRI holds a ginormous user conference every July, which is a great place to move your GIS skills to the next level. If you can't wait until next summer, there are recordings of over 50 technical workshops from the 2016 User Conference available on YouTube. Another under-utilized resource available to all ANR staff is the virtually unlimited access to the thousands of online courses at Lynda.com. These professionally made courses include a number of GIS subjects, including Up and Running with QGIS, ArcGIS Pro Essential Training, and GIS on the Web. Courses are generally 2-3 hours long. If you have a little more time and would like a little stronger foundation, consider taking a MOOC (Massive Online Open Course). UC Davis sponsors a series of five GIS courses on the e-learning platform Coursera.com. These are four-week courses requiring about 5 hours per week, so they cover a lot of territory and are generally very good. For a fee you can complete all five courses and earn a certificate, or you can audit them for free. Check out the syllabus and reviews if you're not sure. ESRI also has a handful of MOOCs, including "Going Places with Spatial Analysis", "Do-It-Yourself Geo Apps", and "Earth Imagery at Work". They also keep a list of links to other GIS MOOCs offered by Universities. See http://www.esri.com/mooc for details. While not GIS software per se, InVEST is probably the most developed multi-purpose ecosystem modeling software out there. Our friends at the Natural Capital Project have developed a 4-hour online course that introduces the main ideas behind ecosystem services and gets you started with InVEST. Both the course and the software are free. See An Introduction to the Natural Capital Approach. Related: For a great intro on approaches to economic valuation of ecosystem services, check out the video lessons from the Conservation Strategy Fund. There are many other great learning resources out there including a lot of tutorials on YouTube, but these are a few that we know from organizations who have put some real time and thought into it. So there you have it - no more excuses for not knowing enough GIS to do what you want! If you don't like online training, then we'd love to see you at an IGIS workshop in 2017, or stop by our online office hours for some free tips.